Safety is a top priority when handling machinery and the health and safety signs for this are certainly an essential addition to any workplace. Workers need to be aware of the potential dangers involved, including keeping clear of a machine’s moving parts. Signs also inform how the equipment should be used and maintained. With a range of machinery safety signs available, workers will be fully informed of what they should and should not do when working with particular pieces of equipment. Remember to order the appropriate signs fixings to go with your chosen signs. One of the most important machinery safety signs is the ‘Do not operate’ sign. The image is a simple circle with a line through, but the message could not be clearer. The sign should be placed close to any buttons or switches that turn the machine on, employees will then be fully aware that the particular machine is not in use, be it because it requires repair or because an engineer is working on it. Maintenance instruction signs ensure that staff members are aware how certain servicing/cleaning tasks should be carried out. ‘Do not oil, clean or use this machine while in motion’ is an important sign, as it will not only help to prevent a worker being injured but could help to prevent damage being caused to a very expensive piece of equipment if it is oiled, cleaned or used whilst in motion. The sign is available in portrait or landscape format and as well as a self-adhesive option there is a magnetic version – making it easy to put into place and move when necessary. There is also a useful sign that you can use to remind workers not to remove any guards as doing so could pose a very big risk to them of injury or even death. Protective clothing should also be worn to protect machinery operators; for example ear defenders, goggles or gloves. ‘Unauthorised persons not to use this machine’ is an important sign because only those who have the right training and authority should be using equipment that could pose a danger. This is a reminder that without the required authority, the machine should not be used. The health and safety implications of a person using a machine without the right authority could be very serious for any business, so all necessary safety precautions must be taken. With its magnetic backing, this sign can be placed near the operating panel of a machine so that it can be seen before a person goes to switch it on. 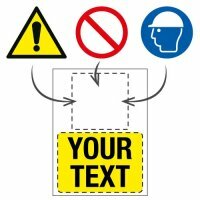 For all otherhealth and safety signs take a look at the full range that we have on offer. Custom prohibition signs are an important option for any business. 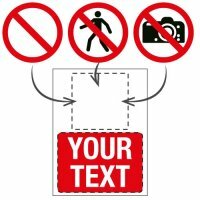 If your company uses bespoke equipment or wants to issue a unique instruction, then it can be hard to find a generic sign that will get the message across. Creating your own sign is very straightforward. Simply choose the size you need, as well as the material. Signs are available in rigid plastic, self-adhesive vinyl and some are even available in a magnetic material – ideal for positioning on the machines themselves. Finally, choose a symbol and add your own wording.